A confirmed bachelor meets the girl of his dreams but still can’t find that spark of commitment required for a successful long term relationship. Over a series of social gatherings, Charles (Hugh Grant) and Carrie (Andie MacDowell) keep meeting, falling in love and somehow not getting together. Charles is part of a motley (i like that word) group who’s main glue is that none of them are married. This group of friends, and their acquaintances, move from relationship to relationship (or not in some cases) wondering about the commitments and faith (in each other) of the couples getting married around them. This Richard Curtis romantic comedy is outstanding. The ensemble cast tear into the script and give it their all. To me at least, this movie is hysterical. Simon Callow is pure genius, often his physical acting will steal a scene from those around him. The late Charlotte Coleman is whacky and bizarre as Hugh Grants unlikely flatmate. 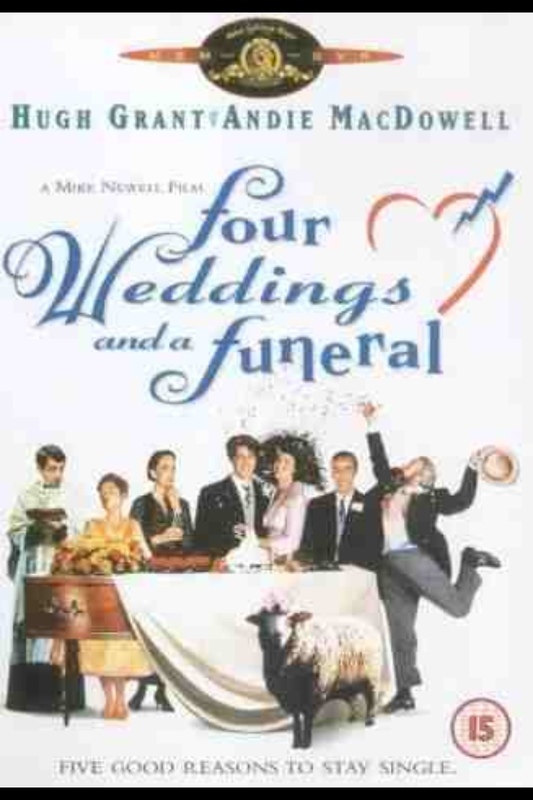 James Fleet is simply watchable although the movie, perhaps a little too like his Vicar of Dibley character to be a breakthrough role for him in the eyes of the audience. Odd really as this film came first. One of those rare things – a Working Title movie, this is beautifully put together. The only off-note is Andie MacDowell. It may be stunning acting or directing but she is so much a fish-out-of-water that the character does not come over as authentic, or even believable. I find it hard, watching this movie as often as I do, to believe that Charles would fall for this woman, compared to the others he has dated. Having said that, the wider cast have significantly more screen time and admirably make up for this. The poem at the funeral is delivered with such power it raises the hairs on your arm. It is the comedy of the piece that you take away with you, each comedic moment (and there are man) is very well done. Middle class England has never had so much fun.